What if you could make money anywhere? What if you learned how to make money online? All you need it a computer and a stable wifi connection. There are more and more location independent jobs that are popping up everywhere and there are many popular “freelanceable” jobs out there. People are learning how to make money online every day and in many different ways, but I’m going to focus on just one way in this article. Let’s talk about how to teach online! My experience is teaching English online but that’s not the only thing you can teach! There are other languages that are needed worldwide and even very particular niche subjects that you can teach if you have the knowledge! What isn’t “going online” nowadays anyway? Teaching online is just another one to add to the list. It makes sense, don’t you think? People are already overworked. After taking care of the kids, working all day, making dinner, running errands and whatever else people have on their plate, fitting in a class at a language center is pretty much not an option. And so… Welcome to the new wave of location independent jobs! Teaching English online is an exciting thing for both teachers and students! The concept is simple. You both log on to an online platform. It might be a special virtual classroom or it might just be Skype. Then, you have a lesson. You converse. You correct mistakes. You have fun! People wanting to know another language can now schedule a class at any time of the day and speak with a native speaker around the world via an online platform. This couldn’t get any more convenient for both parties. I mean, unless they make a microchip we can insert in our brain that automatically allows us to speak whatever language we want… Teaching online is as good as it gets! How to teach online – What’s the concept? It’s pretty simple. We’re becoming a more globalized world and English is desperately needed more and more every day. *Not only English, other languages too, but English is needed the most, so I will focus on this language. However, if you know some English and your language is “popular,” continuing reading because there are location independent teaching jobs for you too! So as I was saying, the world needs more multi-lingual people, people are too busy to get lessons at a language center, or perhaps it’s not even offered in their city, and so the online teacher position has now grown into a full fledge career and people like you are needed! Your students will range from kids to the elderly who are bored and have nothing else to do. I don’t mean for that to sound bad but I really had 60-70-year-olds who told me they were bored and just wanted to learn and talk to people! You might have business men and women who are looking to up their game in the company ranks and need English speaking skills and maybe even students who are looking to study abroad. There also people who have upcoming travels and are looking to speak English so they can get around easier. There are group lessons where you have multiple people in a group chat lesson and sometimes it’s just a one on one lesson. How to Teach Online – What languages are needed? Any! People who can teach Chinese, Portuguese, Japanese, French, Spanish, along with many other languages are needed as well. If you teach a language, you don’t necessarily need to know the student’s native language but you will obviously need to have a language in common. Usually, you will both need to know some level of English. For example, if someone who speaks Portuguese needs to learn Mandrin for his work. Both of you would need to know a bit of English to have a language to communicate in. How to Teach Online – What tools are there? Depending what company you work for, you may have many tools to work with to make teaching online easier and more fun. For example, the company I worked for had a PowerPoint presentation in my virtual classroom. This is the lesson I taught. It has grammar exercises, pictures, listening activities and other features so I don’t have to plan very much. The student can also SEE many things to aid them when they are a lower level which is helpful. If your student doesn’t understand a word and sees a picture that your mouse is pointing to, this is an aid to help explain. My classroom also had a chat box. Perhaps my student is pronouncing something that I simply can’t catch, they can type it for me. Or if there was something I wanted to spell out for the student, I can chat back to them. There was also a notes sections for me in the classroom for anything else I feel I needed to add and the student could copy and paste those notes to keep. Some online classes are simply done on Skype. The only feature here you really have is the chat box. Depending on your awesome teaching abilities, teaching beginners might not be a possible option, but otherwise, you’re golden. All you really need is your voice. Also, let’s not forget about online translators. Do they translate sentences well? Eh, not always. A word? Yeah, it’s not so bad. So if you can’t get an explanation of a word across, use an online translator in the student’s language and copy and paste it in the chat. Easy. How to Teach Online – Do I use a camera? I was very lucky, I could teach in my PJs because I didn’t have to use a camera. We just had a normal conversation online and looked through some slides. Depending on the online school you teach online through you may or may not need a camera. I LOVED not having to use one. It made life easier, that’s for sure. But the way things are going nowadays, I think it’s becoming more and more of a requirement.The more effort you need to put in, like using a camera or preparing the lessons by hand, the more you get paid. Which leads me to my next point…. But the way things are going nowadays, I think it’s becoming more and more of a requirement. The more effort you need to put in, like using a camera or preparing the lessons by hand, the more you get paid. Which leads me to my next point…. 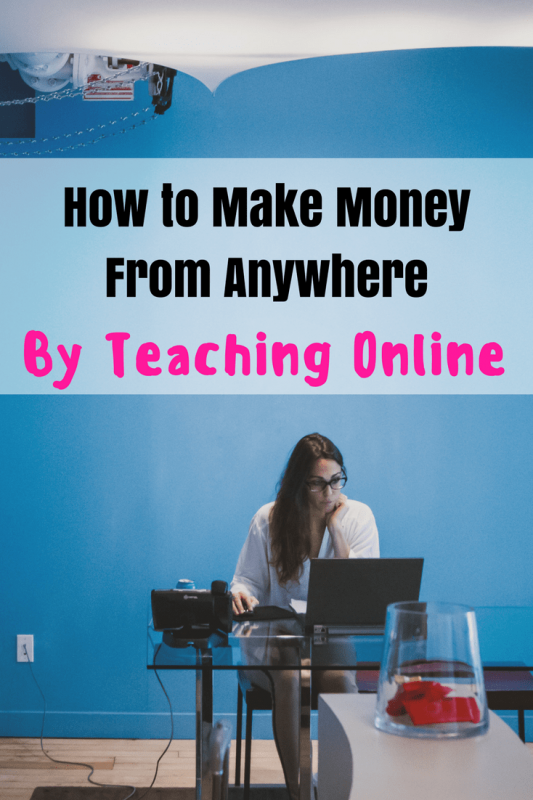 Making money from anywhere sounds great but how much money does an online teacher make? I’m sure you want to talk about money. How much can you actually make being an online teacher? Awesome question. Sorry, you’re not going to like my answer but it, of course, depends on the company. You can get paid anything from a few dollars an hour to over $40 USD an hour. There are sites that pay you hourly and already have a pool of students waiting for a teacher. Then there are sites like Tutor Agent where you name your own price and you must attract the students yourself. What I think the best solution is: Find a company that’s willing to teach you how to teach online. Get your feet wet, teach online for a while and in the background try to get your own pool of students started. That way you can have the best of both worlds. If you become badass enough at teaching online, you can quit the company eventually and just run your own show – making money from anywhere! Sounds pretty sweet, right? At the end of the day, one thing you can count on, the more responsibility you take on, i.e. using a webcam, making the lesson by hand, extending teaching hours etc… The more cash you make! So don’t be scared away by a school that asks a lot of you, you will likely get paid a pretty penny for your time. So what about the schedule? Some require you to have a set time every day and some allow ultimate freedom in choosing your weekly schedule. I had the latter, which was awesome. Again, it depends on the company! There are many jobs out there, so if you qualify, you can be choosy and find one that fits you best. Ultimately, the majority of jobs I’ve seen are rather flexible. So this is a huge plus to teaching online. If you’re a night owl or a morning person, you can work whenever you want because there are always students around the globe. So even if it’s midnight for you, you can log in and teach someone somewhere in the world! So do I have to be a “real” teacher to learn how to teach online!? So how to make money online? What do I need to qualify to teach English online? If you are trying to teach another language other than English, I am not 100% sure. I would suspect that it would be quite similar to what I have below. You would need to double check with the school. Now, I call these the general requirements. Some might require more from you, or you might get away without having one of them. You will have to check with the particular company. These will be required no matter what company you teach online for! – A quiet space to teach in. – A decent computer to work from. – Headset and a webcam. Where do I look for online English teaching jobs? 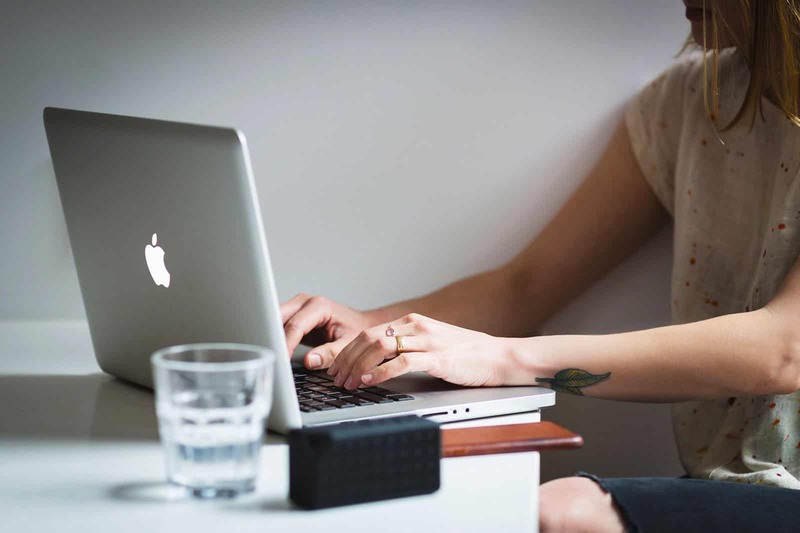 So if you haven’t read my article on freelancing websites, you should. There is more about working online in general and you can find online teaching job on those freelancing sites too. You can also check common ESL sites like the ones I mention in my teaching English abroad post. Seriousteacher.com is a great one to search on. You’d also be very surprised how many things come up for “online English teacher jobs”, “virtual teacher job”, “teach online jobs”… You get the drift. Use Google! 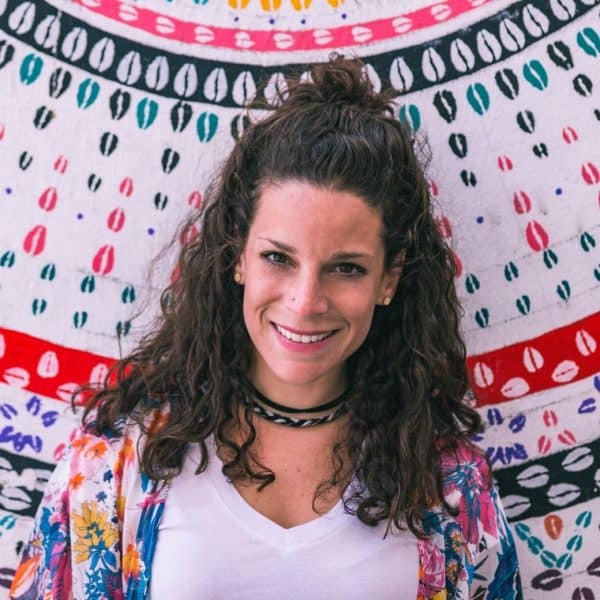 Learning how to make money online by becoming an online teacher was a pretty awesome job because I…. 2. Spoke with cool people around the world. 3. Made my own schedule. 4. I pretty much got paid to simply have conversations! I don’t currently teach online anymore because I’m focusing my efforts on making money in other ways at this time (freelance writing, blogging, etc), however, I know that teaching online will be there should I want to get back in it. I can’t recommend it enough! 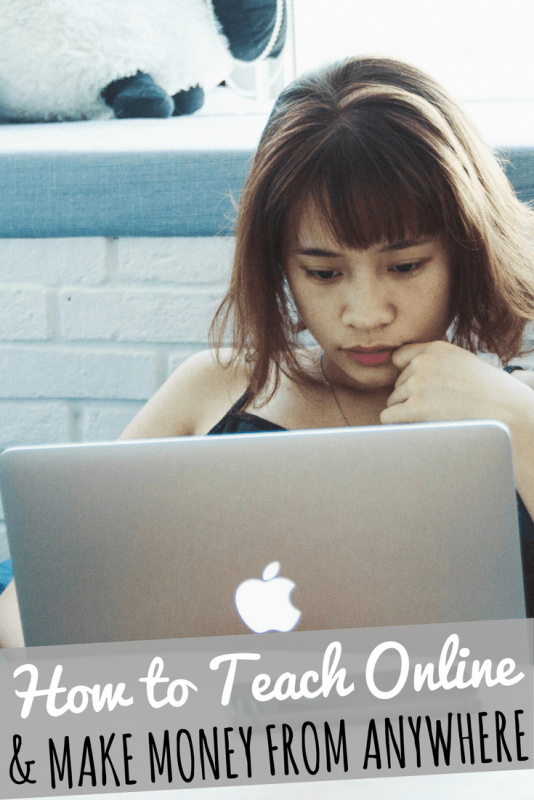 How to Teach Online the SMART Way – My TOP TIPS! I “worked” the system in a way that I found benefited me the most, these are the best tips I can give you for teaching online if you’re in a similar position as I was. I worked at a school in Thailand for one semester to gain the experience of teaching ESL abroad. This is needed to get a good online teaching job! I wanted to make even more money so my second-semester teaching in Thailand, I started teaching online as well. I had many gaps in my “real school” schedule and I would schedule in online teaching hours to fill up my schedule. I made way more money this way and didn’t waste those annoying gaps in between my classes. When I really wanted to make money from anywhere and not be held down to Thailand, I freed up my schedule by leaving my actual school in Thailand and worked for multiple platforms as an online English teacher. In case some weeks were slow on one platform, I’d up my hours on the other. Simple! Get a good headset and make sure your internet is stable! There’s nothing worse or more awkward than having tons of internet issues during your class. You also run the risk of not getting paid for that class if the quality was so bad and your class was pretty much nonexistent. Open certain websites prior to class. Many schools will have the topic or a certain lesson already prepped for you or the students have asked for a particular subject. Open browsers that reflect what the students want to study to have it ready. This can be used as an aid, quick examples if needed, even an article or a worksheet for them to read or do with you in the classes. Have Google translate open in the background for every class. You’ll need it at some point! Close out other programs and browsers that you don’t need so your computer isn’t bogged down with unnecessary programs slowing down your computer and eating up that precious internet bandwidth that you need for your class. Sometimes you’ll have multiple classes back to back – make sure your workstation is comfortable, you have a large glass of water right there, you’ve eaten enough to last you the next few classes, and go to the bathroom before starting class! So I’m super serious about this. I know how to teach online now, can you help me get a job? Actually, I CAN! HOWEVER, please don’t waste anyone’s time and make sure you qualify for this job I’m about to help you get. Read the following carefully and apply only if you know you are serious about the job and tick all the boxes. Laptop with audio and video capability, headset, and a good wifi connection. Since the teaching material is highly geared toward North American standards (Common Core State Standards, hint – study up a bit on this) they are mostly focusing on those with North American accents. Be available for at least seven hours a week during Beijing peak times. You will be teaching Chinese students English. The company will provide the material, no need to plan lessons! You will need to be available for 15 times slots per week during Beijing peak times. Each time slot is 30 minutes long for a total of 7 hours. They don’t need to be consecutive. You can work more hours if you’re available. $14-22/hour depending on hours worked and incentive payouts. Do you qualify? Amazing! Use my link to apply to VIPKID, one of China’s leading online teaching platforms. Make sure to use my link* so they know I referred you! If you click around on the page, make sure to come here and apply only through my link so not only do they know I referred you, but I will get the credit for the referral as well which makes me look good. It’s a big “thank you” if you use my link, so thanks and you’re welcome for the job lead! Again, don’t make me look bad. Only apply if you know you qualify. If you don’t qualify YET, this job opportunity isn’t going anywhere. Just come back and apply when you’re ready. 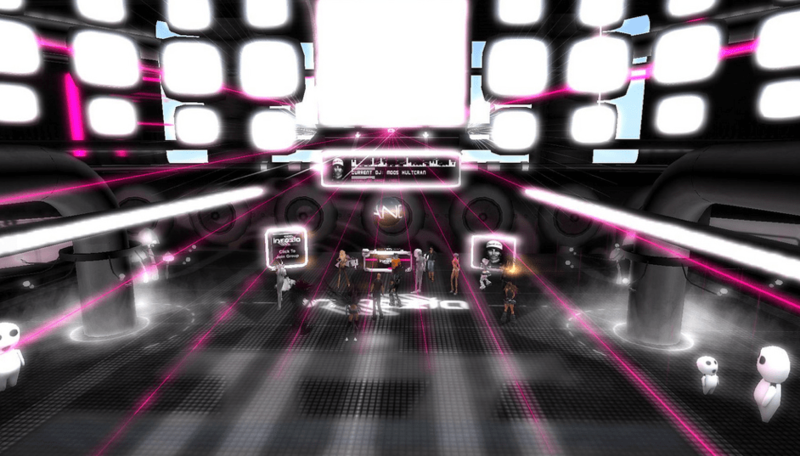 I worked for EF before. Pay is only OK and there were some annoying aspects but overall, totally worth it for the freedom. No experience with the others, I’ve only heard of them and know of a few people who enjoy working for them. The purpose of this post is to show you there is an option to teach online and make money from anywhere! It’s a way people can make extra money from home or possibly make it their full-time job. If you’re in between jobs but have the requirements, this could be a great way to still earn money while on the hunt. And of course, the reason why I had this job… To keep on traveling! These jobs are only becoming more and more abundant especially for English. Do you think this has helped with how to make money online by teaching English so you can travel more? I hope so! Pin this for later? Yay, thanks! *There are affiliate links in this post! Using my links gives me a small commission for my coffee habit and costs you nothing. Thanks for helping me support this blog! Unfortunately I am having trouble finding a job as online english teacher because I’m not a native speaker! It seems to be irrelevant having studied foreign languages for AGES (got BA’s and MA’s degrees) and actually being a polyglot! Totally agree! I’m unfortunately not sure :-/ However, you could potentially freelance (I have an article on it). You could just work for yourself. You can speak other languages, so find people who you can communicate with in their native language and offer English lessons. There are websites (google them, I don’t know them but I’ve seen them before) where you can essentially market yourself and set your own price etc… a bit harder as you need to prove yourself and get the ball rolling but it can be done! Thanks for the information I could teach English, but I would like to teach Spanish as a second language or Italian. Any recommendation? Thank you!? I don’t know where exactly but I know for sure there are opportunities. Just search a bit and I’m sure you’ll find something! You can try WizIQ, this is a perfect e-learning delivery platform to teach and earn online. I know this is random but have you heard of anything like this but for maths teaching? I haven’t. But I don’t think it would be it would be impossible to find. You are so wonderful! Thank you for this! I will keep this in mind! I don’t have my TEFL but I am a Registered Dietitian by day and have taught at a college and teach nutrition-related courses. My population of patients are fairly illiterate so I am use to getting creative! Awesome, Megan! Glad this helped. Best of luck! Thanks a lot for sharing your experience! Can you tell me please what online company you worked for? I’ve taught band in public schools for 10 years. No experience teaching English. Would I still need special training? How part time can you do this? Say a couple hours per week or would it need to be more? Thanks! Hey Mary, not sure I think you’d need SOME experience teaching as a second language. That was a requirement for everything I have applied for. The certification is so easy to do and you’d only need a few months of experience to start applying. I had only four month experience. For hours, every company is different. I worked for a place that only required 10hr a week. For the MyTEFL link..is the 40 hour basic course enough? Hi Theresa! Not unless you have a lot of experience with teaching to begin with and even then, you need the 120hrs to get the certificate that can get you a work permit abroad. Click “learn more” under the courses to read more.